Julie's Guide to ... Airport Dining. Sometimes, you don't have time to read my entire blog. I get it. You just want a quick reference. Thus, I bring you the "Julie's Guide To ..." series. This is your guide to airport dining, including airline lounges, food courts, and sit down restaurants inside the airport. To see all my airport reviews, dive into the full list. American Airlines Admiral's Club: Standard Admiral's Club. (**). Stay tuned! More coming soon. Giants Clubhouse: Good kale salad! T3, post-security (****). Samovar Tea Lounge: Good enough salads, but pricey. Good coffee. International Terminal, Pre-Security (***). Where not to get octopus: Cat Cora's Kitchen. T2, post-security (*). Delta Sky Club: Fairly standard, modern space, eh to food. (**). KLM / Air France Lounge, so very mediocre. Unless you like iced carrots? Knowing my love for snacks, and popcorn in particular, and kettle corn even more specifically, one of my family members got me a bag of White Mountain Kettle Corn, from my home state of New Hampshire. 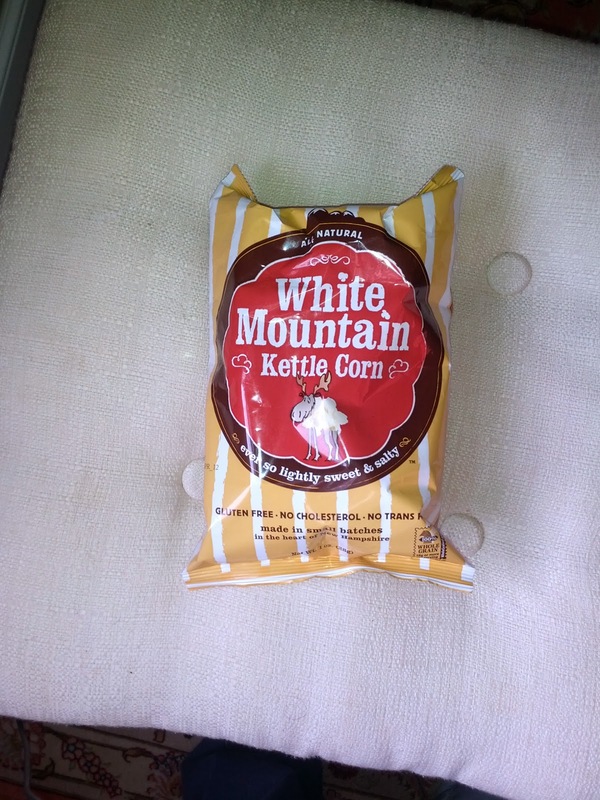 White Mountain Kettle Corn is a family owned company, making small batches of popcorns. The popcorn is "all natural", nut-free, gluten-free, dairy-free, etc, certainly promoted as a healthier snack alternative. They make a single flavor, just kettle corn, described as "ever so lightly sweet and salty". I wanted to love it, since I do really love kettle corn. And I wanted to support my home state. But ... yeah, not very interesting popcorn. This was, sadly, pretty boring kettle corn. It was not super sweet, nor salty, the two things you look for in kettle corn. I guess they do advertise it as "ever so slightly" sweet and salty, but, uh, really, what is the point if you don't go all out? It was also not very fresh tasting, which makes sense, since it is bagged popcorn, who knows when it was popped. Baladie is a Mediterranean cafe near Union square. I swung in one day to grab a few items to go. Not because I particularly like Mediterranean food, but Ojan does, and I was looking for a couple small items to supplement a meal we had waiting for us at home. I don't have much to say about the place, besides the fact that the name "Gourmet Cafe" is a bit misleading. Not entirely sure what would be considered gourmet here. It was not good. Once I ordered the falafel, I heard a microwave start up. Not a good sign. 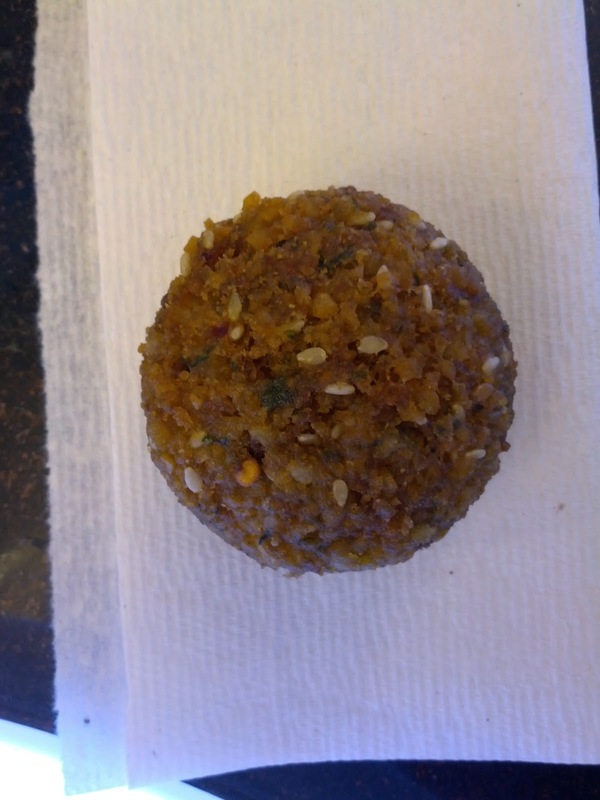 The falafel are not prepared fresh to order, and it was obvious. It wasn't crispy on the outside, and was fairly spongy throughout. The flavor was ok, but overall, being microwaved lead to a pretty crappy product. Maybe this wouldn't have mattered as much inside a wrap? But as an a la carte item, microwaved falafel was not a winner. The dolma was equally disappointing. 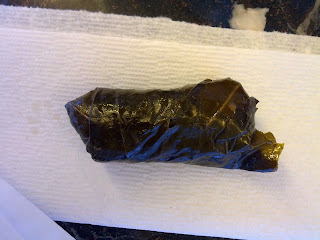 It was very soggy, both the filling and the wrapper. The rice inside was just mush. It was also incredibly oily. Definitely would not get again. While in Zürich attending a conference last year, a large group of us decided to get dinner after the final day of the conference. Since there were so many of us, we opted to do something simple and nearby, rather than seek out an amazing location. Emil, who lived in Zürich before, suggested Weisses Rössli, a place he knew that was nearby, and suggested we go early so that they might actually be able to seat our large group without a reservation. So, right around 6pm, 10 of us tentatively made our way inside, to find the restaurant entirely empty. As in, literally, devoid of patrons. Perhaps not the best sign, but, it was early, and they could seat us, although they looked a bit bewildered by our group, and suggested we stand around the bar and have a drink while they came up with a table arrangement for us. This sounded like a reasonable suggestion, except, the bar had space for perhaps 3 people total, so really, the lot of us just ended up standing in the doorway with flutes of champagne. The menu sounded fantastic. Classic french, with a slew of items I wanted to order. I was glad when Emil agreed to split things with me, so I could try more dishes. Since I was in a large group dining, and was there as part of my work and wanted to focus on the conversation around me, I didn’t take notes during the meal, and wasn’t planning to write up a review. But, bored on the flight home, I decided to write this anyway. I apologize for lack of detail and anything I get wrong, I really *wasn't* trying to be a critic, for once. Short version? The food looked and sounded good, but was highly mediocre. 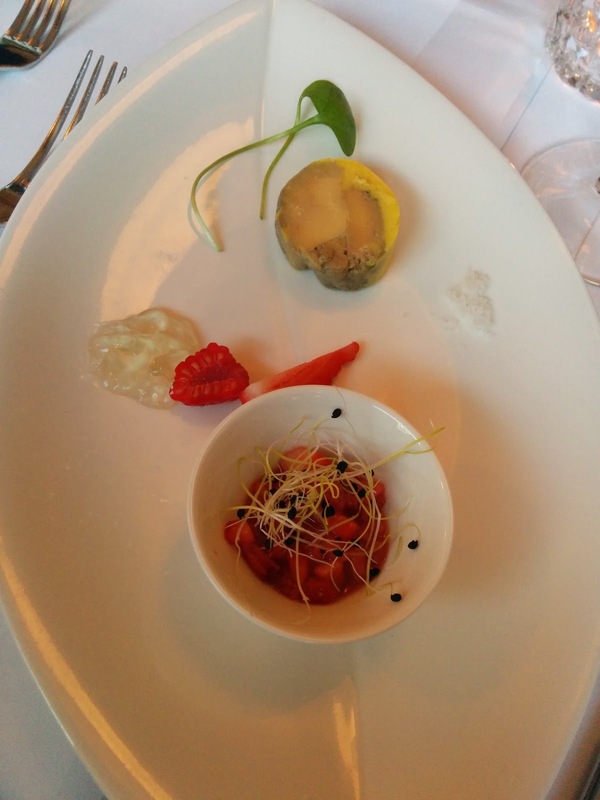 To start, we were presented with an amuse bouche. It was salmon tartar, on top of what I think was cucumber, topped with sprouts. I didn't care for it. The salmon tasted a bit fishy, and it was rather mushy. The dish really needed a creamy component. Starter: Foie gras maison served with strawberry chutney. Since we were at a French restaurant, and we were out of California, we of course had to order the foie gras (yes, foie was still banned at this time). Nearly every person at the table picked a buddy to split a foie gras starter with. We were clearly deprived. The kitchen nicely split the foie gras for us onto individual plates. The foie was a slice of terrine, served too cold. It wasn’t easily spreadable, and had a very unappealing fat layer around it. It wasn’t particularly creamy, or seasoned either. Disappointing. The accompaniments were better than the foie itself. The little dish contained strawberry chutney, and the sweetness paired well with the foie. 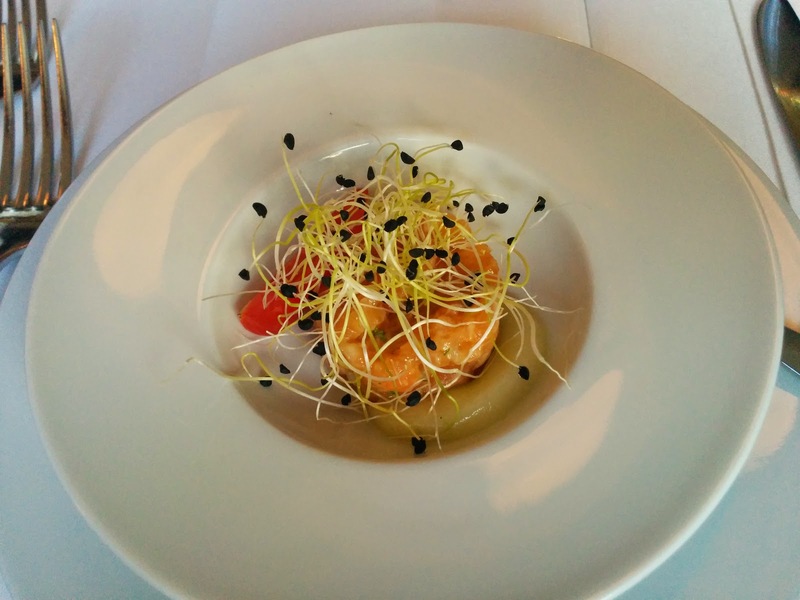 It was garnished with the same onion sprouts as the amuse bouche (which didn't really make sense here). Also on the plate was a slice of strawberry and a raspberry, along with clear gelee. I'm not entirely sure what the gelee was, but it tasted alcoholic. The best part of the plate was the large grains of salt to add some seasoning. I liked how the dish was designed for you to create your "perfect bite" with foie, chutney, gelee, and salt, but, it didn't really do it for me. Overall, this wasn’t bad exactly, but it was one of the weakest preparations of foie I’ve had at a restaurant, and, even though I was missing foie gras, I didn’t really care to finish it. 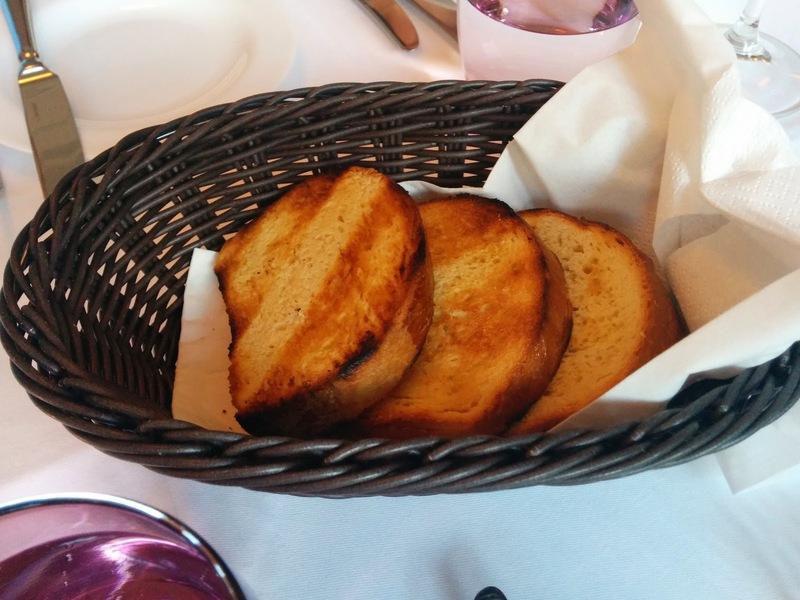 The foie came with baskets of toasted brioche. The bread was only lukewarm, but I appreciated the choice of brioche, always my favorite with foie gras. 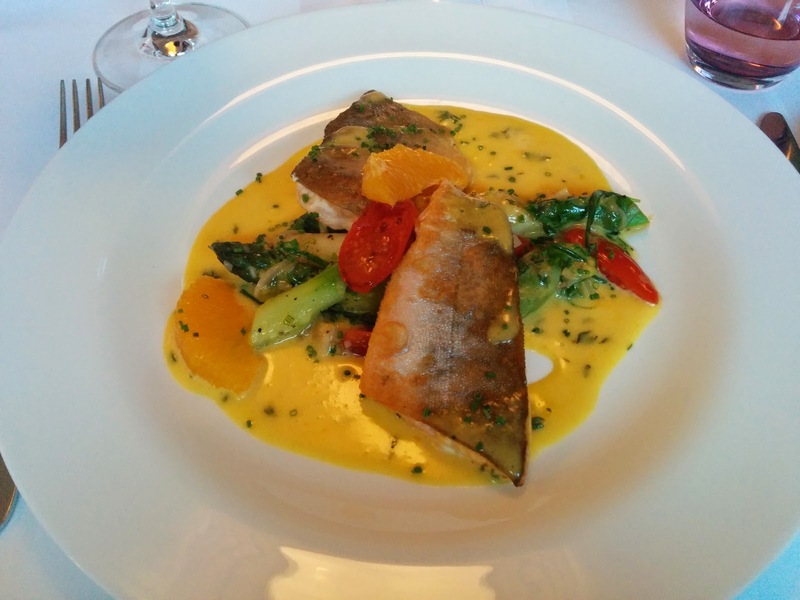 Main: Stir fry fillet of char served on a orange hollandaise with home made gnocchi and asparagus. The menu had three seafood dishes, all of which sounded good. I had a hard time settling on a choice, but was drawn in by the fact that not only did I want the seafood in this one (char), I also really liked both sides that came with it (gnocchi and asparagus). Sadly, soon after I ordered, the waitress came back to tell me they were out of gnocchi. How that was possible, given that we were the first table seated of the night, was beyond me. She asked if I’d like risotto or rice instead. Um, no. I hate rice. I asked what else was possible, thinking some other pasta or vegetable might be offered, but the only other suggestion she had was mashed potatoes. I just wasn’t in the mood mashed potatoes, and they seemed a bit heavy to have with my fish. I asked for just more asparagus instead, since I'd been really enjoying it throughout the trip. I was amused when me dish arrived. Instead of just doubling up the asparagus on my plate, the regular portion was served, plus an extra side of it on a separate plate. The fish was mediocre. Served skin on, cooked ok. It wasn't too dried out, but was still more cooked than my liking. Served as two large filets, a very generous portion. The orange hollandaise I was excited for, since I'm a serious sauce person, even though I don't love orange. It was a fairly mediocre hollandaise, it seemed kinda like it had been sitting a long time. The orange flavor was ok, and there were a few orange segments in the dish too. The asparagus, both on my plate and in my extra side dish, was good, not too overcooked. I liked the seasoning and the leeks(?) in the side dish version in particular. I expected to want to smother this in the hollandaise, but since the sauce wasn't great, I didn't, and ate it as it was. 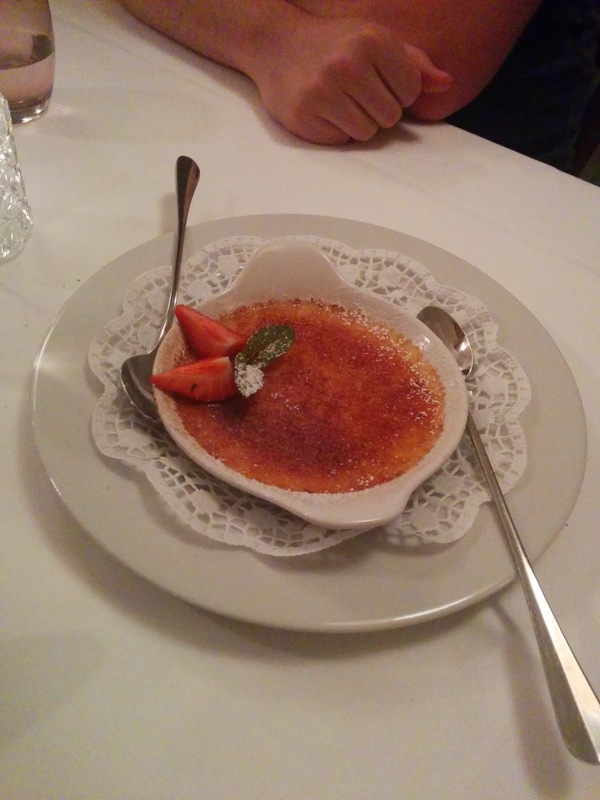 If you’ve read my blog before, you know that I have a serious thing for desserts, for puddings and custards in particular, and that I have very strong feelings on creme brûlée specifically. After such a mediocre meal you’d think I would know better than to order the creme brûlée, but honestly, I can’t resist it when it is on a menu. When done right, it can be so, so good. Spoiler: this was not done right. First, the tap test. When I tap on the top with my spoon, it shouldn’t just bust through, there should be an actual layer of caramelization there providing resistance. But, it shouldn’t be so thick that it is hard to get through. This was too thin. Strike one. Next, the temperature test. I should be able to feel some heat on the outside of the top of the vessel, and the top layer should feel hot, indicating that it was freshly brûléed to order. The rest should be cold. This was all one temperature, room temperature. Strike two. Next, consistency. It should be thick, like a custard, but not jiggly like a panna cotta. This was runny, like a poorly set pudding. Strike three. Finally, flavor. It should have … some. Ideally, real vanilla bean used, with flecks visible. This tasted like nothing. Strike four. There was absolutely no redeeming quality to dessert, and it was about as far from a good creme brûlée as one can get. I certainly wouldn’t get it again. Yeah, I went back to Taco Bell. For breakfast no less. Remember a few years ago, when Taco Bell did a promotion that if anyone stole a base during the World Series, they'd give away free Doritos Locos Tacos? Well, that was my first time ever having Taco Bell. I uh, wasn't impressed. I didn't return. Until now. Why? 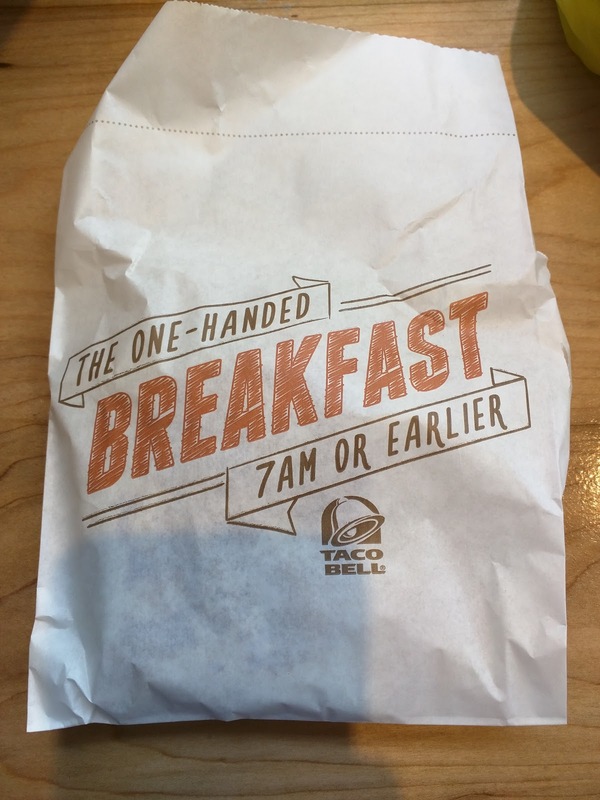 Because Taco Bell did it again, only this year, they offered up free breakfast. Since I can't resist a chance to try silly freebies like this, you know I eagerly headed off to Taco Bell the morning of the promotion. But I didn't head to just any Taco Bell. Nope. 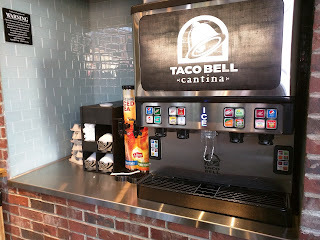 I went to the fancy new Taco Bell Cantina in Soma. 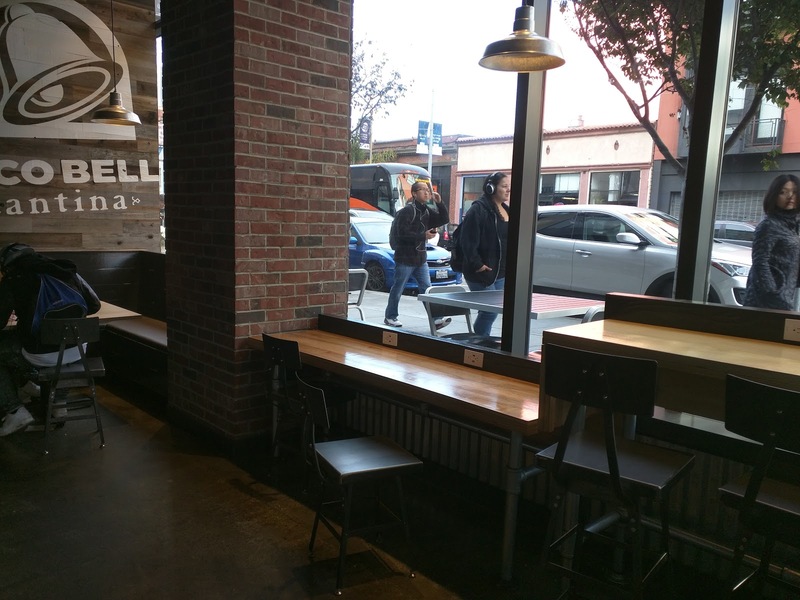 Still obviously a Taco Bell, but, the seating is certainly upgraded. They even have a big communal table in the middle. So hip. 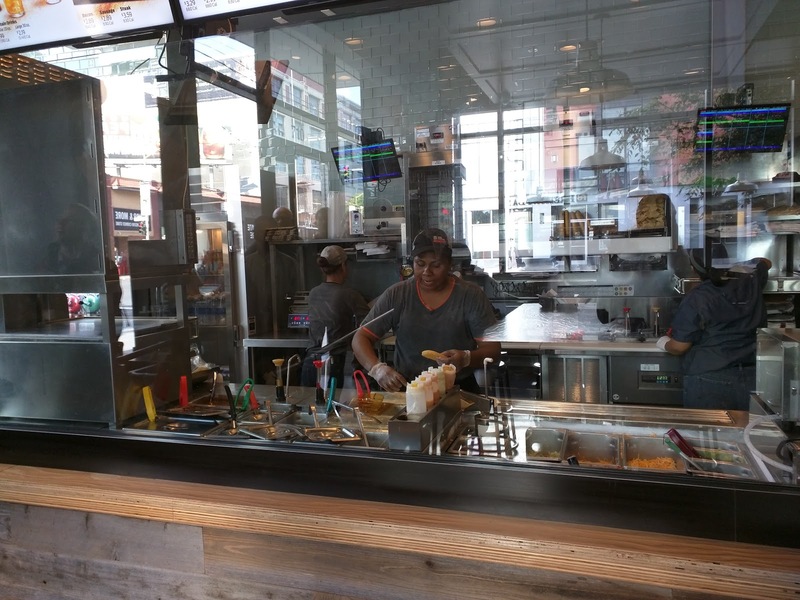 The menu is still standard Taco Bell, and the kitchen I'm sure is a similar set up, but at the Cantina the kitchen is open, so you can watch orders being assembled, more like being in a real taqueria. I hear that they do have some additional menu items, mostly sharable appetizers. The soda machine is also a fancy cantina branded one. But besides that, it is Taco Bell. You order a register, you wait for your number to be called. Or, if you are fancy, you order online first. 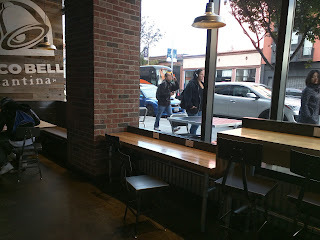 Eventually this location is supposed to serve beer, wine, and sangria, but when I visited they still had a petition near the register to sign to convince someone to let them. Anyway, the food. 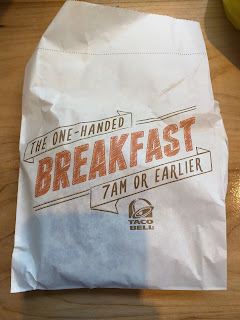 So yes, Taco Bell serves breakfast (and has for about a year and a half). You can likely guess most of the menu, different spins of breakfast burritos. Much like the lunch/dinner menu, the breakfast menu reads like a mis-mash of a few different ingredients, just assembled differently. The basic building blocks are scrambled eggs, bacon/sausage/steak, hashbrowns, and cheese. The simplest option is the "Cheesy Burrito", stuffed with scrambled eggs, cheese, and your choice of meat. The "Grilled Breakfast Burrito" seems to be a small step up, offering nacho cheese sauce instead of shredded cheddar cheese. I imagine it is also grilled, per the name, but they photos don't look it. Next up is the "Grilled Breakfast Burrito Country", with scrambled eggs, potatoes, southern gravy, and your choice of protein. Going bigger still is the "Grand Scrambler", with scrambled egg, cheese and nacho cheese sauce, potatoes, pico de gallo, sour cream, and your choice of protein. If you prefer tacos over burritos, go for the "Biscuit Taco", a fluffy taco shell, filled with scrambled eggs, cheese, and your choice of meat. Or the "Sausage & Cheese Biscuit Taco", with just a sausage patty and cheese, sans egg. The final taco offering is an "A.M. Grilled Taco", a traditional flour tortilla, stuffed with, you guessed it, scrambled egg, cheese, and your choice of meat. It really looks more like a quesadilla though. The last section of the breakfast menu is devoted to the most unique item: the "A.M. Crunchwrap". 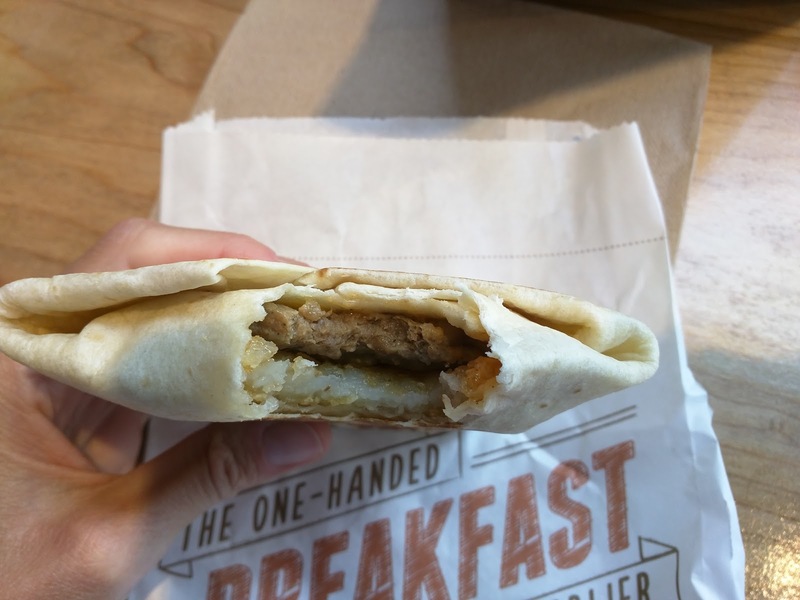 These are full burrito size flour tortillas filled with not just scrambled eggs, cheese, and your protein choice inside, but also a full hash brown patty and sauce. And they aren't just folded over, they are formed into a hex shape, and then grilled. It is the Crunchwraps that Taco Bell was giving away this time. You can get your breakfast sandwich as a combo with a drink and either hashbrowns or little Cinnamon Delights (fried dough balls, stuffed with icing, coated in cinnamon and sugar). The sides are also available a la carte. I ordered my Crunchwrap, and stepped back to watch it be assembled. The staff moved efficiently, with one person adding eggs and proteins, the next putting on the correct sauces and folding them up, and the final person put them into the press to be grilled. Although there was a line, and mine was made to order, it still only took <3 minutes before my number was called out, and my piping hot bag was handed over. Fast food man, it really is fast. So, for the free item, I could select a Crunchwrap. The standard offering comes with scrambled egg, cheese, bacon, a full hash brown, and creamy jalapeño sauce. You can sub out the bacon for a sausage patty free of charge, or opt for steak for a slight price increase. The other Crunchwraps on the menu still have the base of scrambled eggs, cheese, and hashbrown, but the "Country" version uses southern gravy instead of creamy jalapeño sauce and defaults to a sausage patty, and the "California" version throws in some guac and pico de gallo. I didn't realize the other versions were included in the promo, and hadn't looked them up, so I had no idea what was in them (and the signs at the Taco Bell itself don't actually say). So, I opted for the regular Crunchwrap. Except ... I don't really like eggs, even good eggs, and I've had enough fast food eggs at this point to know better than to even try (like the flavorless rubbery eggs in the otherwise good Starbucks breakfast sandwiches) So, I opted for no egg, just like I did at Panera. The standard version uses bacon, but I wasn't really interested in the greasy little bacon crumbles they use for bacon, so went for the sausage patty. This substitution was free of charge. I was pleasantly surprised by the sausage patty at Starbucks (not so much at Panera), so I though it stood a chance here. 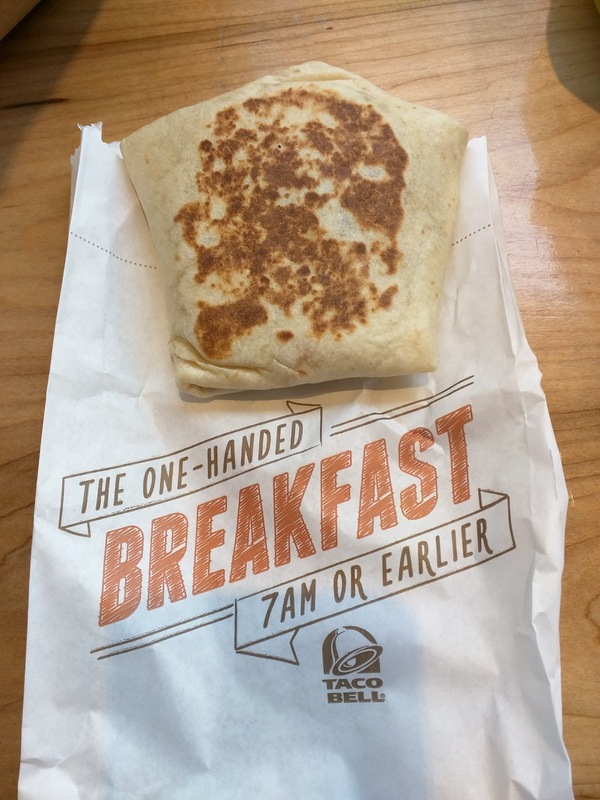 So, my order: Sausage A.M. Crunchwrap, no egg. I pulled it out of the bag, and was a little surprised to see that it did indeed match the photo I had seen online. Hex shaped, grilled. Hmm. It was really hot, clearly fresh from the grill press. The outside was crispy from the contact points. Hmm, not bad, actually. I continued. Sausage A.M. Crunchwrap, no egg: inside. Once I took a few bites from the edge to get past the plain tortilla, I got to the insides. I took a few bites of it all together, rather ... enjoying it. This thing wasn't bad, actually. The hashbrown was indeed a full patty. It wasn't too greasy or oily. Sure, it was a frozen hashbrown, but I grew up on these (the kind you throw into a toaster? I used to slather them with ketchup or syrup and be quite satisfied). The sausage however wasn't great. When it was combined with everything else it was fine, but on its own, it was obvious that it was rather rubbery and flimsy, and didn't taste particularly good. Not that I was expecting high quality at this price point, but the Starbucks one was considerably better. The cheese was basic shredded cheddar cheese, but it was nicely melted. I would have liked more, as there really wasn't much. Extra cheese is an option for customization, for a fee. And lastly, the creamy jalapeño sauce. I appreciated the creamy component, but, this just made no sense at breakfast for me. It had a little kick, which was nice for some flavor, but, random mayo-y sauce wasn't really what I wanted. After reading about the Country Crunchwrap, I do wish I had gone for that instead (sans egg of course). It would have been the same as what I got, but with gravy instead of creamy jalapeño sauce, which just makes a lot more sense for breakfast to me. Plus, mmm, sausage and gravy! I obviously can't evaluate the egg, since I had it left out. I did find the whole thing a bit lacking in flavor, but luckily they have a slew of different hot sauces and ketchup available, so I was able to slather mine in sauce and add whatever kick I wanted. I saw most other diners doing the same. So overall, it really wasn't bad. It was freshly made. I liked the crispy exterior. The cheese was melty. It was hot inside. Hashbrowns are tasty. Do I want another? Well, no, but I was glad to give it a try.